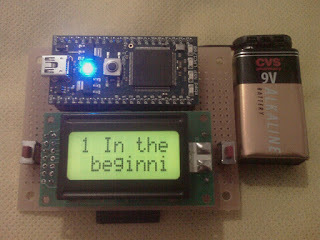 I developed this eBible for the NXP mbed Design Challenge in February 2011. It utilizes an mbed prototying board socketed along with a small LCD text screen, buttons, SD card socket, and other custom circuitry. Abstract, documentation, schematics, C++ source, etc. are available on the mbed.org site.